Next meeting will take place Wednesday, 3rd of October 2018 starting at 19.00 at the Gibraltar Masonic Institute. The Royal Lodge of Friendship is one of the oldest lodges in the world being able to trace it's history back to December 1st 1788. Apart from being in the unique position of have four brethren honoured with the Victoria Cross the lodge has many interesting historical claims. In it's early years there were many Brethren with military links. In 1795 a member signed himself as 'Coriolis' with no initials. He gave his profession as 'brigadier des armées navalles du roy de France’ at the time of Napoleon, when France was a Republic. There was no 'roy de (king of) France' at this time. The French ‘armées navalles' would soon battle against the naval Brethren who had received this refugee aristocrat into their Lodge. Another member signs himself as Gottache Hans Olsen. He was 'Consul of His Danish Majesty at Tunis'. The early Treasurers job cannot have been an envied position as coinages used included Cobbs, pistoles, rials and doubloons. In 1834 the Lodge was almost wiped out by an outbreak of Cholera in Gibraltar. Prince Arthur, Duke of Connaught became a member in December 1875, later becoming a Permanent Honorary Member. The Lodge was granted a Centenary Warrant in 1892, backdated to 1889. In 1903 the Lodge was granted the title 'Royal' when Prince Arthur, Duke of Connaught, became Grand Master. During the First World War frequent collections were made for a fund for Brethren interned as Prisoners-of-War in Germany. On many occasions ceremonies were cancelled due to the absence of candidates. In 1941 the District Grand Master took the Chair at the October meeting as the Master of the Lodge was presumed dead in action. 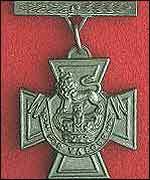 The Victoria Cross is the highest award for valour that can be awarded to members of the British and Commonwealth armed forces of any rank in any service and civilians under military command. It is only awarded for bravery "in the face of the enemy". The VC takes the form of a cross pattee, bearing a crown surmounted by a lion, and the inscription ‘FOR VALOUR’. This was originally to have been ‘FOR BRAVERY’, until it was changed on the recommendation of Queen Victoria, who thought some might erroneously consider that only the recipients of the VC were brave in battle. Queen Victoria signed the Royal Warrant for the introduction of the Victoria Cross on 29 January 1856 and the award was made retrospective to include the Crimean War of 1854-56, since then only 1,358 VC’s have been awarded. It is thought that around 10% of recipients, some 130 Victoria Cross holders were Freemasons. Therefore the privileged Lodges who boast a Victoria Cross holder within its roll of members are extremely few in number, the fact that the Royal Lodge of Friendship boasts no less than four VC recipients within its ranks is not only a rare feat, it truly is a unique Masonic record! VC awarded for his actions during the Charge of the Light Brigade during the Crimean War on 25th October 1854. Please see here a more comprehensive biography. Further information on Bro. Dunn can be obtained from Ionic Lodge, Canada and Wikipedia. VC awarded for his actions during the Victorian Colonial War in New Zealand on on 20th November 1863. Further information on Bro. Pickard can be obtained from Wikipedia. VC awarded posthumously for his actions at Isandlwana on 22nd January 1879 during the Zulu War alongside his fellow brother Lieutenant Melvill. Further information on Bro. Coghill can be obtained from Wikipedia. VC awarded posthumously for his actions at Isandlwana on 22nd January 1879 during the Zulu War alongside his fellow brother Lieutenant Coghill. Further information on Bro. Melvill can be obtained from Wikipedia. The history of the Royal Lodge of Friendship stretching back over 200 years includes many other illustrious and distinguished brethren within its ranks, but we are certain that all will agree that none deserve more recognition than those who fought with valour in defence of the British Empire. Copyright © 2018 ROYAL LODGE OF FRIENDSHIP No.278. All Rights Reserved.